Are you looking for a new household pet? You’re not the only one. Domesticated pets have been in wild demand for quite some time now. There’s been some debates on what’s the best pet to get, why should a person get a pet, and so on. Simply, the best pet and reasons for getting a pet all depend on you. Some pets are really energetic and others (like some cats) are very sloth-like and sleep for long periods of time – usually when they get older though. Once you realize, or know why you’re getting a pet, we can narrow down which pet you should get. Before jumping in it’s good to know that with pets, comes a lot of responsibilities. If you plan on getting a dog, you need to have the time to take them on walks a lot. If you get a cat, their curiosity will allow them to be active alone but they will also need affection. Be sure to have the time for any pet you want to get. It seems like one of the oldest questions in the book – which is the better pet to have, a dog or a cat? This really isn’t an easy question to answer but based on just a few factors we’ve made a decision. However, by all means do not think we are against one or the other, nor are we against certain pet-owners over others. We’ve simply looked at common factors people weigh and hope to bring up some points for those who are unsure whether they want a cat or dog. Cats vs. Dogs – Which One is Better? As mentioned previously, it comes down to personal preference and needs. Learn about both before making your decision. Some pet-owners will prefer owning a dog, and others will prefer a cat. Also keep in consideration if this pet is for you, or will cooperate well with family. There’s a difference between a house pet and a family pet. Because so many have a very deep opinion that is rooted in them for many reasons, the answer to this question is not one that everyone is going to like. There are going to be those who feel that their opinion is right no matter what and there will be no changing their minds which is perfectly fine. 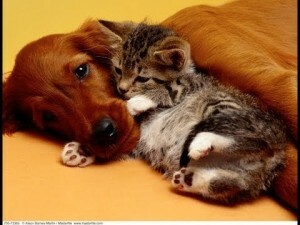 There are those who love dogs and cats equally and are glad to offer both animals a place in their home. While they may like one over the other, they find that both offer something unique that makes the house a lot more like a home and so they don’t want to deprive themselves of both pets. This makes perfect sense. However, there are those who do not really want to have two pets, or they may not be able to have two. They have to decide between one or the other and that is really the only option that is available to them. Therefore, they have to figure out which is the best pet to have in their home. It should be noted that this discussion is not really for those who have an absolute opinion of which is the best and which is not. This is for those who are on the fence. You have to see that those who have formulated an opinion about the superiority of one often has a genuine dislike for the other. They may love dogs so much, for example, that they have a general disdain for cats and there is no convincing them that cats have any value at all. The same is true for those who love cats but don’t like dogs. To some, a dog is a flea ridden mutt that has no business in their home. To try to persuade them otherwise is impossible and so there is no real reason to even try. At least that’s the case for some but we hope all people love both cats and dogs. Instead, what this article does is attempt to help those who are stuck in a real dilemma. It is for those that like both pets, but can only choose one. They have to make a choice but are not able to come up with a conclusive enough decision to choose one over the other. For those in this scenario, here are eight points to help you in making your decision. To help in this decision, the best thing to do is to find areas that are important to most owners and then make a comparison between the two to see which one wins the overall competition. This should give us a real clear idea on which is the best pet to have for your home. Before starting this, let’s start with the obvious. While many may like hamsters, birds, or even ferrets, we will not really consider them in this page due to the fact that they aren’t as controversial as cats vs. dogs. We will not include them in this debate, but they are still a great choice nonetheless. So, now that we have established that, let’s get to the very first issue to consider. While we may not like to admit it, the truth is that there are very few decisions that we make without making cost one of the most important things to consider. The cost to take care of an animal is something that is important to consider, because they deserve your utmost care. They are not just your pet – they are a part of the family, and so you do not want anything to happen to them. This will mean that you will want to do all you can to care for them, so figuring out which one may cost you the most will likely play an important part in making your decision. Your cat has a few requirements. You need food for him or her, a litter box, and litter for the box. You could get toys, but generally they are not necessary. A cat can find a lot of entertainment out of leaf that is blowing in the wind, and they clean themselves so they eliminate a lot of the costs you would have. A dog is a different story. You need food, but you eliminate a lot of the costs like litter and litter boxes. However, if you intend to walk your dog, you need a leash and collar, and you will likely need to buy it toys. Also, if you want it to be a dog that is not on the furniture, you will want a bed for the canine, and you may even want to lock the dog in a cage while you are away or at night. Clearly the dog is a lot more expensive, so score one for the cat. Pets are sometimes high-maintenance and can cost a little more than you’d expect. There are a few ways to save money when caring for your pet. The best way to save money with your pet is something you should do without money in mind originally. You’re supposed to care for their diet, health, grooming, and so on. Doing so, you lessen their chance of injury, getting sick, etc. thus saving you money. Being Alicia’s-Online, we do our best to provide you with well-researched articles on such topics to help all pet-owners. To wrap it up, take care of your pet and they’ll take care of your money! Your cat does a lot of the work of keeping him or herself clean. A cat does not usually get into many things, and they actually are quite persnickety about keeping themselves clean. This makes them quite easy to care for, especially considering that you don’t even need to worry about giving them a bath. Dogs, on the other hand, can be a lot of work to care for in terms of cleanliness. You not only have to clean up after them, because they will get into things, like your garbage (unless you get a trash can that’s dog proof which you can look into here), but they generally require a bath on a regular basis. The cleanliness factor is a big bonus for a cat, so give the felines the 2-0 lead. No one ever posts a sign on their house that says “Beware of Cat.” At least, it is not done seriously, and if it was, no burglar is going to be shaking in his or her boots about the fact that they may be attacked by the cat. The dog wins this part of the contest hands down, so score it for the dog. They are back within one. Don’t get this wrong – there are some very sweet cats out there. Cats can be quite playful, and many love to curl up with you at night time, making your night of rest something really special. Cats can be quite amorous when you come home, and many really can brighten your spirits. However, a cat can turn on you quite quickly. Many cat owners can attest to the fact that they were petting their cat, only to find the feline suddenly turning on them and biting them for no reason (ok, it may not always be that extreme). This rarely, if ever, happens with a dog. In fact, the attitude of a dog is one thing that makes them so amazing. Your dog is thrilled when you come home and often will greet you at home. When you are happy, they are happy, and when you are upset they do all they can to try to brighten your spirits. A dog is really something special in its attitude. A big win for the dog puts it into a tie with the cat. As said before, your cat can really be great. Some cats are really friendly and can’t wait to see you come home. They can be amazing. However, a large number of them are quite standoffish, and this is part of the reason why many find them to not be very good pets. Your dog is an entirely different story. Your canine is more than just a pet – they can be your friend. This is why dogs are often referred to as a man’s best friend. They are amazing and love to go out and do things with you. It is quite rare to see a cat run to the car to go for a ride with you, but dogs want to go where you go. They are friends in so many ways. The dogs are on a roll. They jump ahead, 3-2. Your cat can be quite whinny at times. When they are hungry, they will constantly meow at you, and if you have a cat in heat then you know that they can quite annoying. They never seem to be quiet, and if you are a male around the cat when she is in heat then you know that this can be as annoying as it gets. However, no one ever heard a cat sitting out by the fence meowing at other dogs, cars going by, or simply at nothing. A cat’s cries really have purpose and have a conclusion to them. That is not always true of the dog. Your dog can be quite loud and will bark for hours in some cases if not silenced. They have no issue with going on for hours and that can put you over the top. Again, a cat is never this way, and so they get the point. The score is tied again, this time at three. The truth is that both of these animals can be the source of allergies for people. Many people are allergic to the fur or dander of a dog, and this can lead to a stuffy or runny nose, watery eyes, and difficulty breathing. The same can be said of a cat as well, as they offer their own allergens related to their fur. This makes the answer a wash. However, there are many allergens in a cat’s saliva that are not present in a dog’s. This makes it so that a person can have an allergic reaction simply by the cat licking their hand. There has been no such evidence that this is true with dogs. This gives the dog’s back the lead but if this isn’t the case for you then disregard it. There have been some people who have done amazing things with cats to train them to do all kinds of things. Some have even trained cats to be able to use the toilet. That is some trick to say the least. However, the dog was meant to be trained. They wind up being able to do a whole lot of tricks, if you teach them, and listen so much better. You could tell your cat to sit and stay and they will look at you like you are flat out crazy, while a dog will do all that you ask of them. This is the last category and the cat needs it to tie, but to say a cat can be trained as well as a dog is flat out crazy. Give the dog the point and the match. The truth is that the dog is a better pet when you get down to it. While both have their qualities that you may enjoy, when stacked head-to-head there is nothing that matches the dog. If you are in the market for a pet in your home and can choose either option, then know that the dog is the one to take.